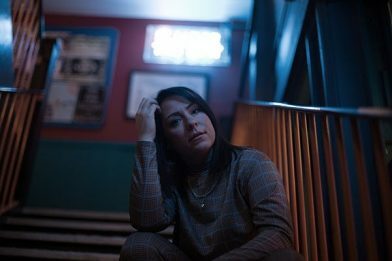 Lucy Spraggan is in a good place and wants to share it with the world – today she announces her fifth studio album ‘Today Was A Good Day’ out on 3rd May on Cooking Vinyl, new single ‘Lucky Stars’ out now and a UK tour which kicks off on the 2nd May in Inverness and includes a sold-out London’s Omeara on the 10th May. With over 50 million YouTube views, 240 million streams on Spotify and the most Googled musician of 2012 – Lucy started out as a singer-songwriter performing at open-mic nights around the country. At just 19 years old she took the brave decision to perform her self-penned hit ‘Last Night (Beer Fear)’ on the X factor and secured a Top 20 single and Top 30 self-released album whilst still competing in the show. It’s since had had over 40 million views on YouTube. Through relentless touring, her innate songwriting ability and an ever-growing fanbase – Lucy has achieved an incredible 4 Top 30 albums (three of which were self-released) – the last of which went to number 12 – and now Lucy’s signed a new record and publishing deal with Cooking Vinyl. ‘Today Was A Good Day’ marks a new chapter for Lucy musically and personally – her fifth studio album has been produced by Jon Maguire (Calum Scott, Kodaline) and Lucy sounds at her most confident and accomplished. Last year, Lucy released ‘Stick The Kettle On’ – the first track from the new album – in support of CALM – The Campaign Against Living Miserably and wanted to use her experiences to help others. Her knack for telling a story through her songs hasn’t changed and in the past, it has earned her comparisons to Courtney Barnett, KT Tunstall and Ed Sheeran. This talent continues on the new album with tracks like ‘Connie’s Bar’, inspired by a woman she met in Florida; the new single ‘Lucky Stars’ and the poignant goodbye song ‘The Waiting Room’ and ‘Home Wasn’t Built In A Day’. “I thank my lucky stars for my family,” says Lucy about the new single. “I’ve been through some incredibly dark times and although I’ve made many steps forward, I still get anxious and paranoid. This is how I came up with the idea for the video for Lucky Stars – when I feel anxious, I feel like people are staring at me as if I’m from outer space… So I donned an astronaut suit for the entire video ”. After beginning the year as support for Melissa Etheridge across Europe and Scandinavia, Lucy Spraggan now prepares for her own headline tour across the US and Europe, including playing SXSW and then her own 13-date UK headline tour. Playing live has always been what Lucy loves to do most – she was the first female artist to headline Kendal Calling and she’s also the first X Factor artist to play Glastonbury. Lucy played The Acoustic Stage to a completely full tent in 2017 and describes the performance as a ‘life-changing show’. Releasing this fifth album is proof of her enduring appeal.